I am a Windsor & Newton guy. More specifically, I am a W&N Series 7 kinda guy. I have tried other brushes of well known and well thought of brands, but I always end back with my trusty series 7s. Raphael, Rosemary & Co and others are good brushes but for me just don’t quite hold up to the old faithful. I may have just found something that rivals the quality and also meets my preference for a firmer brush with more ‘snap’ so I can feel what I am painting. I should have picked them up sooner! I really like the length of the brush – both the handle and the bristles, and more importantly the bristles are firm enough to give good resistance whilst painting, which I find helps me control the paint more. They also snap back to their fine point really quickly and easily – an attribute of the Series 7 that I always miss whenever I try other brushes. 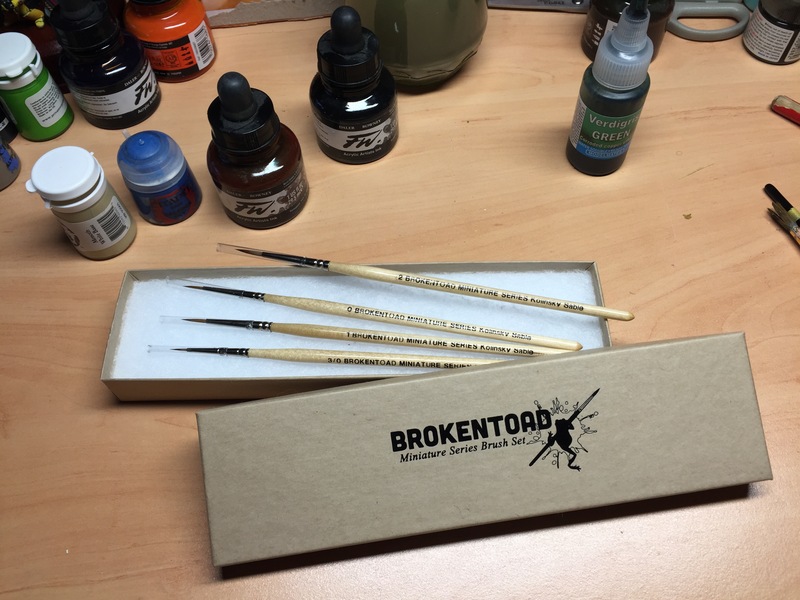 BrokenToad Miniature Series MK2 brushes are individually handmade from 100% pure Siberian male Kolinsky sable (Mustela Sibirica) hair, giving superior snap and paint retention, fitted onto a sleek, contemporary wooden handle shaped to give the brush excellent control and balance. The brush head features an ample belly, capable of holding a generous amount of paint, which tapers to a very fine point allowing the paint to flow precisely and accurately onto the model. With its natural conical shape and excellent snap we feel that handmade Kolinsky sable hair brushes are the best choice for model painters. I can’t really argue with that! In terms of price, these Brokentoad brushes retail at about £6-£6.50 per brush this compares quite favourably to the Windsor & Newton Series 7 that start at around the £8.00 mark going up to £10 for a size 2. There is a significant difference in price for such a similar quality in brush to make Brokentoad brushes well worth the investment. Only time will tell whether they last as well as the Series 7s do! Thank you for the quick review. I will try those out when my W&N are worn out. about ten years or more when I noticed I had not taken care of my W&N brushes so decided to do so and it took a long time but I did using everything type of brush cleaner I had but they worked but not all the brushes survived so I waited for sales on them but I did pick-up others to make -up for what was missing but I did in fact I found a online store that had sets of the Series 7 brushes which I ordered two sets because one was the short hairs and the other was long hairs .